Common attributes of all public key objects. Definition at line 374 of file p11_object.h. Definition at line 162 of file p11_object.cpp. Definition at line 46 of file p11_object.cpp. Referenced by Botan::PKCS11::AttributeContainer::add_binary(), Botan::PKCS11::AttributeContainer::add_bool(), Botan::PKCS11::AttributeContainer::add_class(), and Botan::PKCS11::AttributeContainer::add_string(). Definition at line 34 of file p11_object.cpp. Definition at line 94 of file p11_object.h. Definition at line 40 of file p11_object.cpp. 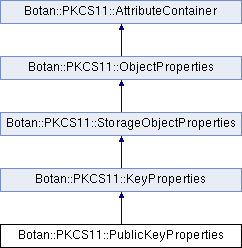 References Botan::PKCS11::AttributeContainer::add_attribute(), Botan::PKCS11::False, and Botan::PKCS11::True. Add a class attribute (CKA_CLASS / AttributeType::Class). Definition at line 22 of file p11_object.cpp. Definition at line 112 of file p11_object.h. Referenced by Botan::PKCS11::CertificateProperties::CertificateProperties(), Botan::PKCS11::DomainParameterProperties::DomainParameterProperties(), and Botan::PKCS11::KeyProperties::KeyProperties(). Definition at line 28 of file p11_object.cpp. Definition at line 50 of file p11_object.h. Definition at line 62 of file p11_object.h. Referenced by Botan::PKCS11::Object::copy(), and Botan::PKCS11::Object::Object(). Definition at line 56 of file p11_object.h. Referenced by Botan::PKCS11::AttributeContainer::add_attribute(), Botan::PKCS11::Object::copy(), and Botan::PKCS11::Object::Object(). Definition at line 364 of file p11_object.h. Definition at line 183 of file p11_object.h. Definition at line 358 of file p11_object.h. Definition at line 227 of file p11_object.h. Definition at line 349 of file p11_object.h. Definition at line 233 of file p11_object.h. Definition at line 387 of file p11_object.h. Definition at line 343 of file p11_object.h. Definition at line 331 of file p11_object.h. Definition at line 200 of file p11_object.h. Definition at line 221 of file p11_object.h. Definition at line 215 of file p11_object.h. Definition at line 431 of file p11_object.h. Definition at line 337 of file p11_object.h. Definition at line 381 of file p11_object.h. Definition at line 206 of file p11_object.h. Definition at line 414 of file p11_object.h. Definition at line 393 of file p11_object.h. Definition at line 399 of file p11_object.h. Definition at line 405 of file p11_object.h. Definition at line 425 of file p11_object.h.